The moving average measure, which smooths out the volatility, rose to 1.61, a record high relative to previous expansions (“zero” indicates average growth over the 1990-present period). All sectors covered contributed positively to the measure, but strength was driven by the employment components. The Oregon Department of Employment estimated job growth of 14,700 for December. 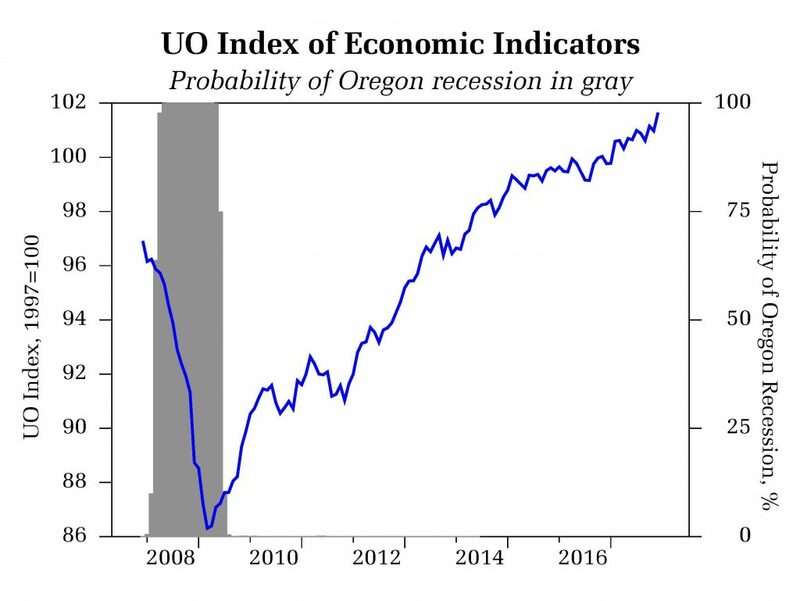 Future revisions may smooth the recent job growth numbers, but if the numbers hold they suggest that Oregon’s economy strengthened toward the end of the year. The University of Oregon Index of Economic Indicators rose in December; a general uptrend in the index continues despite the expansion reaching a more mature phase in which we would expect more sideways movement. Employment services (mostly temporary help workers) rose while initial unemployment claims fell to a fresh low. Firms are seeing strong demand for their goods and services and consequently the pace of layoffs continues to decline. Building permits (smoothed) rose as construction picks up to a pace more consistent with that of past expansions. Consumer confidence edged higher while manufacturing and traded goods indicators (new orders for core capital goods, hours worked in manufacturing, and the Oregon weight distance tax) remained largely unchanged.